Before hearing a note of their music, an eager collection of family, friends, and lovers of new music got their first glimpse of the night’s featured six composers (and one librettist) milling about The Great Room with barely contained anticipation/nerves. In just a few moments, the culmination of over 75 workshop hours that began last September would be in front of the public in the WWII-era wood-paneled recital hall in Fort Greene, Brooklyn. The seven artists – Sidney Marquez Boquiren, Mikael Karlsson, Robert Paterson, Rachel Peters, Ronnie Reshef, Zach Redler and Sara Cooper – were chosen last summer by American Opera Projects to become the sixth group of fellows in the Brooklyn opera company’s training program Composers & the Voice. 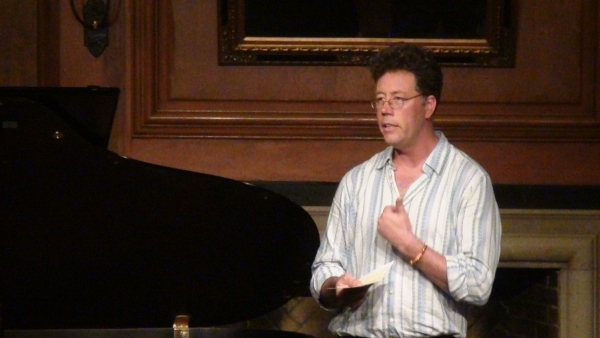 Under the tutelage of C&V artistic director Steven Osgood and a trio of music directors, the team of emerging artists spent hours every month writing for a group of six opera singers that represented the full range of voice types. Each private meeting consisted of putting those compositions in front of their peers and analyzing the mechanics of vocal music – from dramatic tension, to physical limitations, to the use of rhythm in comedy. On May 20 and 21, the C&V fellows returned to the room that invited so much experimentation but this time the doors were wide open to the public. Close friends, unknown peers, curious musicphiles, a collection of previous C&V composers, and some bold–faced names from the opera world were in attendance for Composers & the Voice: First Glimpse, the debut concert of a selection of songs written in the workshops. After a brief introduction from Osgood, the night began with two songs by Robert Paterson from an opera-in-development called The Companion (with libretto by David Cote) set in a future where humans and androids develop relationships with varying degrees of success. Soprano Andrea Arias Martin brought out the desperation of a woman seeking greater emotional responses from her android lover in the first song “Talk To Me” (Jeanne-Minette Cilliers on piano), followed by tenor Brandon Snook‘s eerie and poignant song “What Did I Do Today?” (Mila Henry, accompaniment) by the android who eagerly does everything a perfect boyfriend should, but with a literal disconnect. The second set of songs began with more music by Robert Paterson, this time the results of a workshop challenge where the composers were told to set to music “found text” – scraps of writings one happens upon in our day to day world. In “CAPTCHA” (Cilliers, piano), bass-baritone Justin Hopkins brought unexpected emotion to the random words and gibberish that serve as annoying gatekeepers on the internet. 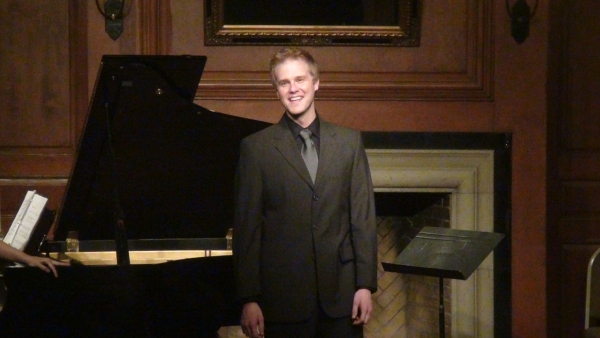 Expected emotion accompanied the next song, Ronnie Reshef‘s “Transport” (Kelly Horsted, piano). Martin sang the harrowing plea of a woman on a train to a concentration camp in a work from a Holocaust opera Reshef is developing. Hopkins returned to the stage as a soldier suffering through flashbacks (that reference a certain famous Fort Greene poet) in composer Sidney Marquez Boquiren‘s “Sunday, Early Evening.” To convey the shell-shock in the soldier’s head, Mila Henry skillfully pounded the 88 keys like a seal on crack. The next set featured songs performed by each of the women, beginning appropriately with Rachel Peters‘ “How to Be a Woman: Postscript,” based on the witty modern feminist manual by Caitlin Moran. 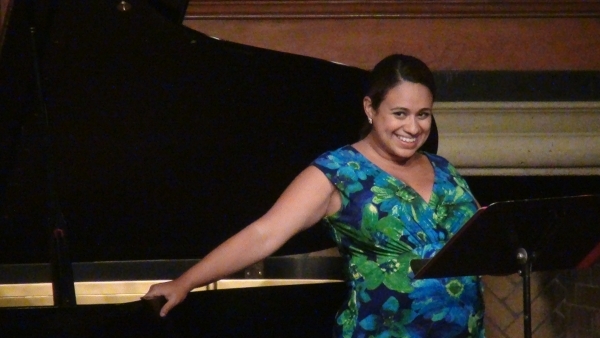 Andrea Arias Martin sang the frustrated requests of a contemporary woman with a careful balance of strength and poignancy with Kelly Horsted returning on piano. “Riverview Amusement Park” (Shoremount-Obra/Horsted) and “The View from the Lunch Counter” (Ringle/Cilliers) both presented bittersweet memories of childhood by Sidney Marquez Boquiren and librettist Daniel Neer from their opera-in-development Route 321. In the next set, C&V’s first composer-librettist team of Zach Redler and Sara Cooper presented two songs from an opera they are working on called Windows. The first, “She Frowns” (Ringle/Cilliers) met one of the workshop challenges to create a song using only four lines of text. “Magnanimous” gave Andrea more than four lines, and more than a handful of four-letter words, to deliver the most sexual song of the evening (and a deft comic flair), supported by Jeanne-Minette. Certainly the most controversial and polarizing song of the evening was “Baby in a Jar” by Rachel Peters wherein Brandon Snook sang to the nominal subject in a dark comic lullaby (Cilliers/Robert Maddock, librettist). The final three songs presaged the mundane suffering awaiting many audience members on their subway journeys home. “You” (Hopkins/Cilliers) and “He” (Snook/Horsted) from Ronnie Reshef’s Subway Songs, presented two parts of a love triangle – a pining ex-lover and a jealous husband, respectively – sharing the same subway car. 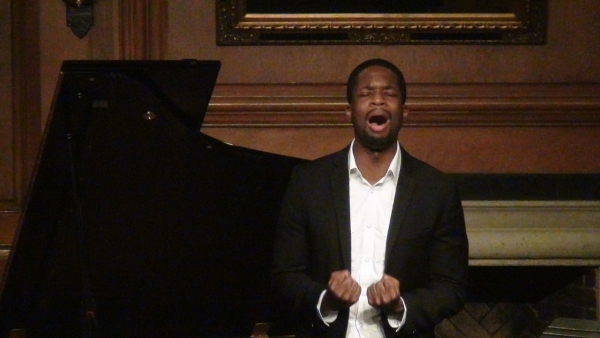 The evening finished with Jorell effortlessly portraying the simmering annoyance and volatility of the standard NYC traveler in Rachel Peters’ “A Commuter’s Request” (Mila Henry, piano). For the past several years the First Glimpse concert has been the highlight of our Spring season bringing a burst of refreshing air onto the new music scene and this year’s class of emerging artists did not disappoint. What did you think of this year’s First Glimpse concert? Let us know in the comment section below! In the coming week we will update this post with videos of the songs mentioned so be sure to come back! More photos from the evening can be seen here on our Flickr page. You are currently browsing the Have a Voice blog archives for May, 2012.